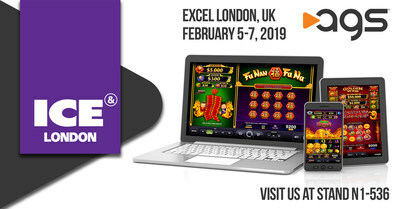 LAS VEGAS, Jan. 23, 2019 /PRNewswire/ -- AGS (NYSE: AGS) (or the "Company"), a leading designer and supplier of electronic gaming machines, table products, and interactive solutions for the gaming industry, will showcase its obsession with providing the best platforms and game titles for online real-money and social gaming at ICE London February 5-7 in Stand N1-536 at ExCel London. ICE London is the benchmark and driver of the B2B Gaming industry's international growth. Coming together for three days February 5-7, 2019 to engage with the latest solutions, content, and networking opportunities across the globe and across all sectors of gaming, ICE London presents the complete platform to build revenue, innovations, and invaluable relationships. To register, visit https://www.icelondon.uk.com/choose-your-pass#/.